Lemur Autovision Reveals Your Driving Habits | OhGizmo! Everyone likes to think they’re a good driver, no matter what your friends, family, passengers or arresting officer might tell you. But for those who are truly curious as to what kind of motorist they really are, the Lemur Autovision provides an unbiased report of your top speed, how far you’ve traveled and how many times you’ve suddenly hit the brakes. 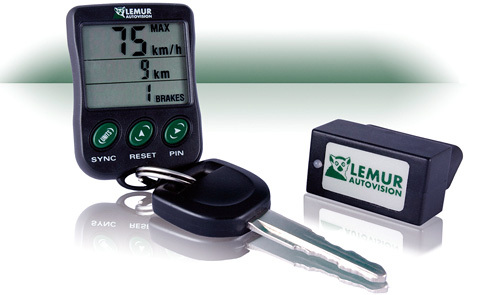 The Lemur’s FOB, which features an easy-to-read & hard-to-misinterpret LCD display, syncs with an included sensor that easily connects to your vehicle’s OBD-II port. So it doesn’t rely on a built-in gyro or accelerometer to gauge your speed or actions, but pulls the data from your vehicle’s own electronic monitoring systems. The FOB also features buttons for resetting the stats for each trip, and setting up a PIN to stop drivers concerned with the revealing stats (teenagers etc.) from tampering with the device. At $99.95 CDN the Lemur Autovision isn’t cheap, but if it helps curb your lead foot, it’s far more affordable than a speeding ticket.